Annual conference at the Southwest College of Naturopthic Medicine in Tempe, Arizona. Topics include female endocrine stress, treatment of IBS, medicinal use of seaweeds, therapies in early cognitive dysfunction, treatment of connective tissue disorder, plant lectins, and much more. 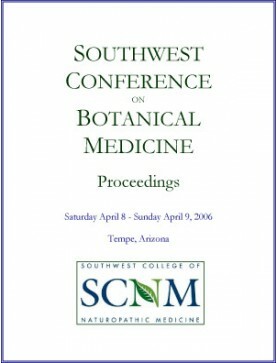 2006 Southwest Conference on Botanical Medicines: Conference Book. Order download of PDF ..
Full Set of Southwest Conference on Botanical Medicines MP3 recordings includes these titles (..
Speaker: Cascade Anderson Geller. Plants used in low dosage for powerful effects were once comm..
Speaker: Jill Stansbury. Lectins are responsible for a variety of cell to cell communications i..
Speaker: Kenneth Proefrock. Discusses the intelligent use of botanicals to treat inflammatory d..
Speaker: Yong Deng. Classical Chinese treatment for IBS includes several different formulas and..
Speaker: Bill Mitchell. Therapies for osteoarthritis, rheumatoid arthritis, weak muscles, burs..
Speaker: Paul Bergner. A review of alterative, lymphatic, tonic, and astringent herbs for aller..
Speaker: Deborah Frances. Details of useful protocols for migraines and tension headaches provi..
Speaker: Ryan Drum. Harvesting, preparing and using these three ubiquitous herbs. Useful informatio..
Speaker: Rosemary Gladstar. Land stewardship, habitat protection and sustainable cultivation pr..
Speaker: Donald Yance. The HPAA is central to the functioning of all aspects of the endocrine s..
Speaker: Michael Moore. Evaluating and treating acute, sub-acute and chronic GI problems. Rational h..
Speaker: Mary Bove. Join Herbalist Mary Bove in the herb garden with clinical pearls, formulations, ..
Speaker: Bill Mitchell. Includes management of chronic lymphocytic leukemia, acute myelogenous leuke..
Speaker: Ryan Drum. The ethnobotany and contemporary therapeutic uses of naked desert parsley (..
Speaker: Deborah Frances. Includes alternatives to pharmaceutical intervention in hypertension. ..
Panelists: Paul Bergner, Mary Bove, ND, Jillian Stansbury, ND and Kenneth Proefrock, ND. P..
Speaker: Rosemary Gladstar. Learned in Laos and China, the art of making your own herbal pill b..
Speaker: Deborah Frances. Herbs are powerful allies in keeping our minds sharp. Includes case histo..
Speaker: Donald Yance. Continued from Part 1. Carcinogenesis takes many years to become maligna..
Speaker: Donald Yance. Carcinogenesis takes many years to become malignant cancer. There are ample o..
Speaker: Cascade Anderson Geller. Includes a discussion of natural foods and herbs for creating pet ..
Speaker: Paul Bergner. Includes corrected information and applications for about 30 herbs ..
Speaker: Mary Bove. Compares and contrasts the attributes of specific plants and their clinical..
Speaker: Deborah Frances. Safe and effective ceremonies use a variety of herbs for different pu..
Speaker: Bill Mitchell. Includes psoriasis, macular degeneration, ulcerative colitis, hepatitis..
Speaker: Rosemary Gladstar. Common sense practices to restore and maintain vitality at any age. Incl..
Speaker: Michael Moore. The inimitable Michael Moore describes antioxidants, UV blockers, wound..
Speaker: Cascade Anderson Geller. Sniff, nibble and enjoy the herbs while learning some of thei..
Speaker: Kenneth Proefrock. Treatment of asthma, COPD, pulmonary fibrosis and lung cancer. Desc..
Speaker: Ryan Drum. Modern research has confirmed the healing properties of seaweeds as antiviral, a..
Speaker: Jill Stansbury. Botanicals for promoting the regulation and function of the thyroid, g..